Ayrshire Growth Deal: What does it mean for small businesses? At the beginning of March 2019, all three Ayrshire Councils, along with the UK and Scottish Governments, announced a £250 million Ayrshire Growth Deal. The Scottish Government will invest up to £103 million over 10 years, the UK Government will invest up to £103 million over 15 years, subject to approval of final business cases for each project. East, North and South Ayrshire Councils, which will match this investment with up to £45.5 million. This will result in a Deal worth £251.5 million. Pre-market engagement is your opportunity to get yourself “tender ready” before contract opportunities are announced. After all, if the first time you spot a contract opportunity, it is already formally out for competition and the wider market place, then you would be behind the game. 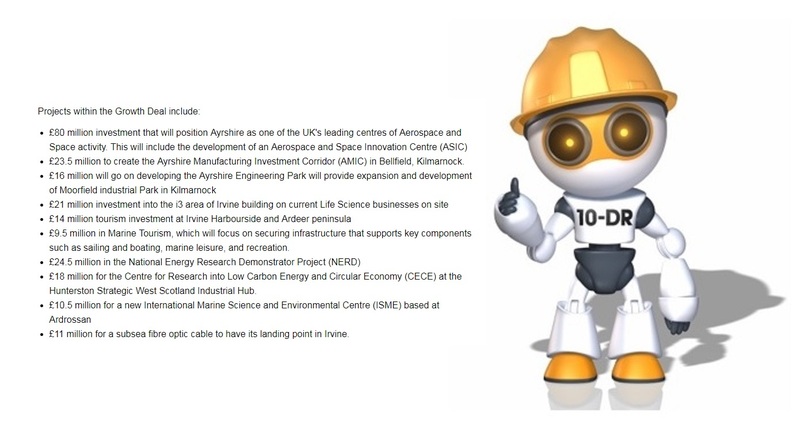 The Supplier Development Programme can help you be proactive in preparing for the contract opportunities that will arise from the Ayrshire Growth Deal. Sign up for free training for Scottish-based SMEs through the Supplier Development Programme to get the skills you need to tender successfully. “The signing of the Heads of Terms for the Ayrshire Growth Deal provides all suppliers a once in a generation chance to take advantage of the £250 million investment programme across Ayrshire. I would encourage all suppliers to take advantage of the opportunities by engaging with the Supplier Development Programme. The Programme provides training and advice to ensure that you can bid correctly and with confidence for the upcoming projects. For more information and further support, visit www.sdpscotland.co.uk.